There have already been 16 GATORADE Call-Ups this season. A few days removed from the Showcase, we look at who has the best chance of being No. 17. Justin Dentmon of the Austin Toros was named NBA Development League Performer of the Week for games played Jan. 9-15 after averaging 26.3 points, 7.0 assists and 4.3 rebounds in 39.5 minutes. Which players shined brighted when it counted most? A panel of NBA scouts selected the All-NBA D-League Showcase teams following the four-day 16-game event that took place this week in Reno. The top players in the NBA D-League will come together in Orlando during NBA All-Star 2012. Vote daily to send your favorite players to the game. 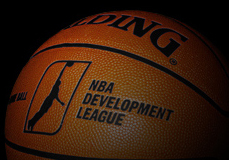 The NBA D-League's premier event featured 16 games in four days. Look back at all of the action with the Showcase Blog. Was this email newsletter forwarded to you? Sign up to get your own free copy of the NBA D-League Insider Newsletter. This message was sent to you because you subscribed to this NBA D-League Insider email newsletter. Update your email address, favorite team or other preferences at the All-Access Member Center. This message was sent to: nba@saevee.com If you would like to unsubscribe, click here.